You are a happy wanderer passing through a village in the land of Serenia when you notice a large crowd. Being a curious wanderer, you saunter over to see what is going on. From the middle of the chaos you hear a bell ringing. As you get closer, you see the town cryer with a proclamation from the king of Serenia. "HEAR YE" "HEAR YE", he cries. "His Majesty King George, has just suffered a terrible loss. His fair daughter, the Princess Priscilla, has been abducted by the great and dreadful wizard, Harlin, to his castle beyond the great mountains." the crowd is now hushed, waiting to hear more. The town cryer then shouts, "His Majesty offers half his kingdom to anybody who can bring the princess back safely." That is all he has to say, but it leaves you shaking. Not only are you a happy wanderer, but you love an adventure as well, and half a kingdom is a great reward. You decide to find her. But where are the great mountains? As you look around, you see no mountains. Just a vast desert that seems to never end. You ask a villager where the great mountains are located, and he points to the north and tells you, "there are a great many dangers on the way to the great mountains, and the Wizard Harlin is very powerful and bad." You thank the villager for his information and start off to the north. As you enter the desert, you check your belongings. You are carrying a flask of water, a small knife, a loaf of bread and a blanket. Not much for such a long journey, but it will have to do, for you have no money. And so, you are on your way. 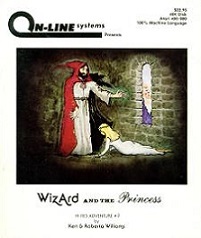 While the first Hi-res Adventure, Mystery House, introduced the world to the first adventure game with graphics, Wizard and the Princess is believed to be the first adventure game with colors. 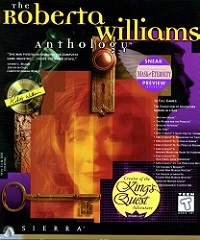 Designed by Ken and Roberta Williams, the game was originally made for the Apple II computer in 1980 and re-released many times for other platforms, including a release by the title "Adventure in Serenia" in late 1982, the first Sierra game designed for the IBM PC, still under the On-Line Systems name. Wizard and the Princess is actually the prequel to Sierra's highly successful King's Quest series. This is the most obvious in King's Quest V where King Graham travels to Serenia and follows almost the same path as the wanderer of Wizard and the Princess does. Even several puzzles are similar. 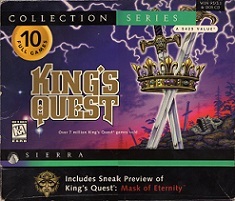 It is generally accepted that the nameless wanderer is King Edward the Benevolent from whom King Graham inherits the throne in King's Quest 1: Quest for the Crown, which was released in 1984.